Engineered for maximum durability and long life with impact drivers. Forged, so they fit fasteners more precisely, which reduces stripping and increases the life of the bit. Manufactured with heavy-duty, cold-forged, high grade steel to withstand extremely high torque output. Black oxide finish resists corrosion. For driving and removing fasteners. Engineered for maximum durability and long life with impact drivers. Forged, so they fit more precisely, which reduces stripping. Manufactured with heavy-duty, cold-forged, high grade steel to withstand extremely high torque output. Black oxide finish resists corrosion. For driving and removing fasteners. Engineered for maximum durability and long life with impact drivers. Forged, so they fit more precisely, which reduces stripping. Manufactured with heavy-duty, cold-forged, high grade steel to withstand extremely high torque output. Black oxide finish resists corrosion. For driving and removing fasteners. Engineered for maximum durability and long life with impact drivers. Forged, so they fit more precisely, which reduces stripping. Manufactured with heavy-duty, cold-forged, high grade steel to withstand extremely high torque output. Black oxide finish resists corrosion. For driving and removing fasteners. Engineered for maximum durability and long life with impact drivers. Forged, so they fit more precisely, which reduces stripping. Manufactured with heavy-duty, cold-forged, high grade steel to withstand extremely high torque output. Black oxide finish resists corrosion. For driving and removing fasteners. Engineered for maximum durability and long life with impact drivers. Forged, so they fit more precisely, which reduces stripping. Manufactured with heavy-duty, cold-forged, high grade steel to withstand extremely high torque output. Black oxide finish resists corrosion. For use in driving screws and other fasteners by hand tool application or with corded or cordless drills. 1/4'' shank size. Shock-resistant steel. Hardened core to reduce wear. Snub nose design fits perfectly into hex socket adapters and the tips are precision ground to seat firmly into the screw head. Heat treated. Shock resistant steel. Hardened core for extra strength and reduced breakage. Snub nose design for ideal fitment. Shock resistant steel. Hardened core for extra strength and reduced breakage. Snub nose design for ideal fitment. Used in power drill chuck or chuck adapter for common round, oval, and flat head fastener applications; 1/4" hex shank. 1 Piece. 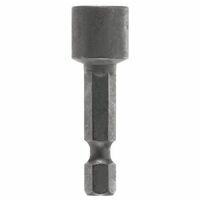 Used in power drill chuck or chuck adapter for common round, oval, and flat head fastener applications; 1/4" hex shank. 1 Piece. 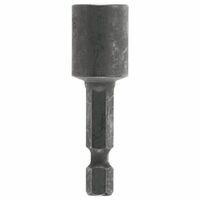 Used in power drill chuck or chuck adapter for common round, oval, and flat head fastener applications; 1/4" hex shank. 1 Piece. Quick, easy change-out in production use with S2 tool steel construction and a Rockwell Hardness between 58-62. Used in high torque applications; 1/4" hex drive. Used commonly in furniture assembly, bicycle maintenance, and manufacturing equipment. Used commonly in furniture assembly, bicycle maintenance, and manufacturing equipment. Used in high torque power tools; for use in power drill chuck and chuck adapter; 1/4" hex shank. Made of shock resistant tool steel. Fits directly into the power drill chuck or Quick-Change chuck adapter. Provides a tight fit in the fastener recess in applications such as cabinetry, decking, drywall; 1/4" hex shank. Made of shock resistant tool steel. Fits directly into the power drill chuck or Quick-Change chuck adapter. Provides a tight fit in the fastener recess in applications such as cabinetry, decking, drywall; 1/4" hex shank. Used in high torque power tools; for use in power drill chuck and chuck adapter; 1/4" hex shank. Used in high torque power tools; for use in power drill chuck and chuck adapter; 1/4" hex shank. Tamper resistant Torx screws feature a post in the center of the recess; this post will only fit into a tamper resistant Torx bit. Used in applications such as control panels, display cases, high-tech equipment, security; 1/4" hex shank. Depth setting bit tip offers screw gun feature in a power drill. Shock-resistant tool steel for maximum durability. Hardened core for extra strength and reduced breakage. Heat treated to resist breakage and wear. Advanced hardening process provides maximum durability; 1/4" hex shank. Advanced hardening process provides maximum durability; 1/4" hex shank. Specially designed to reduce stripping. Heat treated to resist breakage and wear. Made of shock resistant tool steel for maximum durability. Hardened core for extra strength and reduced breakage. Specially designed to reduce stripping. Heat treated to resist breakage and wear. Made of shock resistant tool steel for maximum durability. Hardened core for extra strength and reduced breakage. Specially designed to reduce stripping. Heat treated to resist breakage and wear. Made of shock resistant tool steel for maximum durability. Hardened core for extra strength and reduced breakage. Made of shock resistant tool steel; used in common round, oval, and flat head fastener applications; 1/4" hex shank. 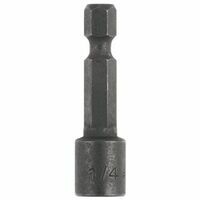 Advanced hardening process provides maximum durability; 1/4" hex shank. Specially designed to reduce stripping. Heat treated to resist breakage and wear. Made of shock resistant tool steel for maximum durability. Hardened core for extra strength and reduced breakage. Made of shock resistant tool steel; 1/4" hex shank. Made of high grade S2 Steel; 1/4" hex shank. Specially designed to reduce stripping. Heat treated to resist breakage and wear. Made of shock resistant tool steel for maximum durability. Hardened core for extra strength and reduced breakage. Made of shock resistant tool steel; 1/4" hex shank. Made of shock resistant tool steel; 1/4" hex shank. Milled, one piece made of shock resistant tool steel. Made of shock resistant tool steel for maximum durability. Advanced hardened core, heat treated for extra strength reduces stripping and breakage; 1/4" hex shank. Milled, one piece made of shock resistant tool steel. Milled, one piece made of shock resistant tool steel. Specially designed to reduce stripping. Heat treated to resist breakage and wear. Made of shock resistant tool steel for maximum durability. Hardened core for extra strength and reduced breakage. Tamper resistant Torx screws feature a post in the center of the recess; this post will only fit into a tamper resistant Torx bit. Used in applications such as control panels, display cases, high-tech equipment, security; 1/4" hex shank. Tamper resistant Torx screws feature a post in the center of the recess; this post will only fit into a tamper resistant Torx bit. Used in applications such as control panels, display cases, high-tech equipment, security; 1/4" hex shank. Tamper resistant Torx screws feature a post in the center of the recess; this post will only fit into a tamper resistant Torx bit. Used in applications such as control panels, display cases, high-tech equipment, security; 1/4" hex shank. Made of shock resistant tool steel for maximum durability, resistance breakage and wear in metal, wood, deck and drywall applications. Hardened core for extra strength, reduced breakage and stripping. Universal 1/4" hex shank. High performance for metal, wood, deck and drywall applications. Specially designed to reduce stripping. Heat treated to resist breakage and wear. Made of shock resistant tool steel for maximum durability. Hardened core for extra strength and reduced breakage; 1/4" hex shank. Made of shock resistant tool steel for maximum durability. Advanced hardened core, heat treated for extra strength reduces stripping and breakage; 1/4" hex shank. Engineered for maximum durability and long life with impact drivers. Forged, so they fit fasteners more precisely, which reduces stripping and increases the life of the bit. Manufactured with heavy-duty, cold-forged, high grade steel to withstand extremely high torque output. Black oxide finish resists corrosion. Engineered for maximum durability and long life with impact drivers. Forged, so they fit fasteners more precisely, which reduces stripping and increases the life of the bit. Manufactured with heavy-duty, cold-forged, high grade steel to withstand extremely high torque output. Black oxide finish resists corrosion. Engineered for maximum durability and long life with impact drivers. Forged, so they fit fasteners more precisely, which reduces stripping and increases the life of the bit. Manufactured with heavy-duty, cold-forged, high grade steel to withstand extremely high torque output. Black oxide finish resists corrosion. Square recess impact insert bits. For driving and removing fasteners. Engineered for maximum durability and long life with impact drivers. Forged so they fit more precisely, which reduces stripping and increases the life of the bit. Heavy-duty, cold-forged, high grade steel to withstand extreme high torque output. Black oxide finish resists corrosion. Dewalt Insert Bit, Series: FlexTorq, NO 2 Point, Phillips Point, 1 in Overall Length, Hexagonal Shank, 1/4 in Shank, Magnetic Screw Locking, S2 Modified Steel, For Impact Drivers Dewalt Insert Bit, Series: FlexTorq, NO 3 Point, Phillips Point, 1 in Overall Length, Hexagonal Shank, 1/4 in Shank, Magnetic Screw Locking, S2 Modified Steel, For Impact Drivers Impact ready bit with magnetic screw lock system. Impact ready bit with magnetic screw lock system. Made of shock resistant tool steel. Fits directly into the power drill chuck or Quick-Change chuck adapter. Provides a tight fit in the fastener recess in applications such as cabinetry, decking, drywall; 1/4" hex shank. Quick, easy change-out in production use with S2 tool steel construction and a Rockwell Hardness between 58-62. Used in high torque applications; 1/4" hex drive. Quick, easy change-out in production use with S2 tool steel construction and a Rockwell Hardness between 58-62. Used in high torque applications; 1/4" hex drive. S2 tool steel construction with a Rockwell Hardness between 58-62 for strength and precise fit; quick, easy change-out in production use; 1/4" hex shank. 2 per package. Quick, easy change-out in production use with S2 tool steel construction and a Rockwell Hardness between 58-62. Used in high torque applications; 1/4" hex drive. Quick, easy change-out in production use with S2 tool steel construction and a Rockwell Hardness between 58-62. Used in high torque applications; 1/4" hex drive. Quick, easy change-out in production use with S2 tool steel construction and a Rockwell Hardness between 58-62. Used in high torque applications; 1/4" hex drive. For driving and removing fasteners. Engineered for maximum durability and long life with impact drivers. Forged, so they fit more precisely, which reduces stripping. Manufactured with heavy-duty, cold-forged, high grade steel to withstand extremely high torque output. Black oxide finish resists corrosion. For driving and removing fasteners. Engineered for maximum durability and long life with impact drivers. Forged, so they fit more precisely, which reduces stripping. Manufactured with heavy-duty, cold-forged, high grade steel to withstand extremely high torque output. Black oxide finish resists corrosion. For driving and removing fasteners. Engineered for maximum durability and long life with impact drivers. Forged, so they fit more precisely, which reduces stripping. Manufactured with heavy-duty, cold-forged, high grade steel to withstand extremely high torque output. Black oxide finish resists corrosion. Quick, easy change-out in production use with S2 tool steel construction and a Rockwell Hardness between 58-62. Used in high torque applications; 1/4" hex drive. Quick, easy change-out in production use with S2 tool steel construction and a Rockwell Hardness between 58-62. Used in high torque applications; 1/4" hex drive. Quick, easy change-out in production use with S2 tool steel construction and a Rockwell Hardness between 58-62. Used in high torque applications; 1/4" hex drive. Made of shock resistant tool steel for maximum durability. Advanced hardened core, heat treated for extra strength reduces stripping and breakage; 1/4" hex shank. Used in high torque power tools; for use in power drill chuck and chuck adapter; 1/4" hex shank. Clutch type G power bit made with S2 tool steel construction with a Rockwell Hardness between 58-62 for strength and precise fit; 1/4" hex shank. Used in high torque power tools; for use in power drill chuck and chuck adapter; 1/4" hex shank. Hardened steel body for increased durability. Adapts sockets for use in drills. Universal 1/4" hex shank locking system prevents slipping. Quick, easy change-out in production use with S2 tool steel construction and a Rockwell Hardness between 58-62. Used in high torque applications; 1/4" hex drive. Shock resistant steel. Hardened core for extra strength and reduced breakage. Snub nose design for ideal fitment. Clutch type G power bit made with S2 tool steel construction with a Rockwell Hardness between 58-62 for strength and precise fit; 1/4" hex shank. 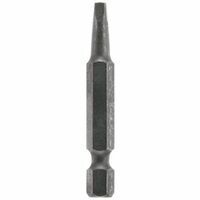 Bosch Power Screwdriver Bit, NO 2 Point, Square Recess, R2 Point, 2 in Overall Length, Hexagonal Shank, 1/4 in Shank, Steel, Black Oxide, Impact Tough Hardness, For Impact Driver Geometric design provides the shock absorption zone. Proprietary steel and heat treat process for maximum strength and durability. Forged tips for maximum grip. Geometric design provides the shock absorption zone. Proprietary steel and heat treat process for maximum strength and durability. Forged tips for maximum grip. Geometric design provides the shock absorption zone. Proprietary steel and heat treat process for maximum strength and durability. Forged tips for maximum grip. Shock resistant steel. Hardened core for extra strength and reduced breakage. Snub nose design for ideal fitment. Impact duty driver bits are engineered for extreme durability and long life. Made from proprietary steel and heat treated to control hardness. Designed for shock absorption to extend life. Forged tip allows for a secure grip and maximum contact eliminating stripping or slipping. Ideal for electrical fasteners. Absorbs more torque. Includes: No 1 and No 2 insert bits. Geometric design provides the shock absorption zone. Proprietary steel and heat treat process for maximum strength and durability. Forged tip allows for a secure grip and maximum contact eliminating stripping or slipping. Geometric design provides the shock absorption zone. Proprietary steel and heat treat process for maximum strength and durability. Forged tip allows for a secure grip and maximum contact eliminating stripping or slipping. Geometric design provides the shock absorption zone. Proprietary steel and heat treat process for maximum strength and durability. Forged tip allows for a secure grip and maximum contact eliminating stripping or slipping. Shock resistant tool steel for maximum durability. Hardened core for extra strength and long life. Heat treated to resist breakage and wear. Shock resistant tool steel for maximum durability. Hardened core for extra strength and long life. Heat treated to resist breakage and wear. Geometric design provides the shock absorption zone. Proprietary steel and heat treat process for maximum strength and durability. Forged tips for maximum grip. 2 Per Package Shock resistant tool steel for maximum durability. Hardened core for extra strength and long life. Heat treated to resist breakage and wear. Made of shock resistant tool steel for maximum durability, resistance breakage and wear in metal, wood, deck and drywall applications. Hardened core for extra strength, reduced breakage and stripping. Universal 1/4" hex shank. Made of shock resistant tool steel for maximum durability, resistance breakage and wear in metal, wood, deck and drywall applications. Hardened core for extra strength, reduced breakage and stripping. Universal 1/4" hex shank. Geometric design provides the shock absorption zone. Proprietary steel and heat treat process for maximum strength and durability. Forged tips for maximum grip. Geometric design provides the shock absorption zone. Proprietary steel and heat treat process for maximum strength and durability. Forged tip allows for a secure grip and maximum contact eliminating stripping or slipping. Geometric design provides the shock absorption zone. Proprietary steel and heat treat process for maximum strength and durability. Forged tips for maximum grip. Geometric design provides the shock absorption zone. Proprietary steel and heat treat process for maximum strength and durability. Forged tip allows for a secure grip and maximum contact eliminating stripping or slipping. Engineered for extreme durability. Made from proprietary steel and heat treated to control hardness. Geometric design provides shock absorption zone to extend life. The forged tip allows for a secure grip and maximum contact, eliminating stripping or slipping. Includes: (1) Phillips Shockwave power bit; 1/4'' diameter. Geometric design provides the shock absorption zone. Proprietary steel and heat treat process for maximum strength and durability. Forged tips for maximum grip. Geometric design provides the shock absorption zone. Proprietary steel and heat treat process for maximum strength and durability. Forged tips for maximum grip. Geometric design provides the shock absorption zone. Proprietary steel and heat treat process for maximum strength and durability. Forged tips for maximum grip. Geometric design provides the shock absorption zone. Proprietary steel and heat treat process for maximum strength and durability. Forged tips for maximum grip. Geometric design provides the shock absorption zone. Proprietary steel and heat treat process for maximum strength and durability. Forged tips for maximum grip. Geometric design provides the shock absorption zone. Proprietary steel and heat treat process for maximum strength and durability. Forged tips for maximum grip. Geometric design provides the shock absorption zone. Proprietary steel and heat treat process for maximum strength and durability. Forged tips for maximum grip. Milwaukee Shockwave Impact duty bits are engineered to be very durable. The optimized Shockzone geometry is unique for each tip to provide longer life and absorb more torque. The precise fit custom machined tip prevents stripping and reduces wobble, while the custom Alloy76 steel proprietary heat treat process maximizes resistance to wear and shock. Made of shock resistant tool steel. Fits directly into the power drill chuck or Quick-Change chuck adapter. Provides a tight fit in the fastener recess in applications such as cabinetry, decking, drywall; 1/4" hex shank. Performance-optimized S2 steel construction for extended life. Ideal for driving screws in a variety of heavy duty applications including metal fastening, deck building, framing, and installing plywood subfloor. For use with high torque impact drivers and driver-drills. Includes: (2) ImpactX #2 Phillips bits. Shock resistant tool steel for maximum durability. Hardened core for extra strength and long life. Heat treated to resist breakage and wear. Xtended Torsion Zone to absorb high-torque of new impact drivers. Precision engineered for a tighter fit and less cam-out. Heat-treated manufacturing for stronger bit. High visibility sleeve with laser etched markings for user convenience. 2" overall length. 10X life over standard impact bits. High-visibility sleeve with laser-etched markings for user convenience. Xtended Torsion Zone to absorb high-torque of new impact drivers. Precision engineered for a tighter fit and less cam-out. Heat-treated manufacturing for stronger bit. High visibility sleeve with laser etched markings for user convenience. 2" overall length. Made of shock resistant tool steel for maximum durability. Hardened core for extra strength and reduced breakage and stripping. Heat treated to resist breakage and wear; 1/4" hex shank. For impact drills and drivers. Engineered for maximum durability and long life with impact drivers. Fit fasteners more precisely, which reduces stripping. Manufactured with heavy-duty, cold-forged, high grade steel to withstand high torque output. Black oxide finish resists corrosion. Impact power bit. Square recess bit is built for maximum durability and long life with impact drivers. Forged bit for ideal fit, which reduces stripping. Cold forged, high grade steel to withstand high torque output. Black oxide finish resists corrosion. Tempered steel for increased durability. Ribbed tip withstands up to 50 percent more torque before camout. Proven sub-zero tempering process gives these bits long life and increased durability. Tempered steel for increased durability. Ribbed tip withstands up to 50 percent more torque before camout. Proven sub-zero tempering process gives these bits long life and increased durability. Tempered steel for increased durability. Ribbed tip withstands up to 50 percent more torque before camout. Proven sub-zero tempering process gives these bits long life and increased durability. Performance-optimized S2 steel construction for extended life. Ideal for driving screws in a variety of heavy duty applications including metal fastening, deck building, framing, and installing plywood subfloor. For use with high torque impact drivers and driver-drills. Includes: (2) ImpactX #2 Phillips bits. Specially designed to reduce stripping. Heat treated to resist breakage and wear. Made of shock resistant tool steel for maximum durability. Hardened core for extra strength and reduced breakage. Clutch type G power bit made with S2 tool steel construction with a Rockwell Hardness between 58-62 for strength and precise fit; 1/4" hex shank. Specially designed to reduce stripping. Heat treated to resist breakage and wear. Made of shock resistant tool steel for maximum durability. Hardened core for extra strength and reduced breakage. Specially designed to reduce stripping. Heat treated to resist breakage and wear. Made of shock resistant tool steel for maximum durability. Hardened core for extra strength and reduced breakage. Made of shock resistant tool steel for maximum durability. Advanced hardened core, heat treated for extra strength reduces stripping and breakage; 1/4" hex shank. Made of shock resistant tool steel for maximum durability. Hardened core for extra strength and reduced breakage and stripping. Heat treated to resist breakage and wear; 1/4" hex shank. Ball retention design for quick-change application. Pin lock design for production applications. Made of shock resistant tool steel for maximum durability with hardened core for extra strength and reduced breakage in applications such as metal, wood, deck and drywall; 1/4" hex shank. Bosch Nutsetter Bit, Magnetic, Series: ITNS, 5/16 in Drive, 1/4 in Shank, 1-7/8 in Overall Length, Steel, Black Oxide, Gray Handle, Impact Tough Hardness Forged tips create a stronger and more flexible torsion zone, reducing breakage and extending bit life. Hardened cores increase bit strength and reduce fracturing. Ideal for fast, easy driving of nuts, bolts and hex head screws. Rugged single piece construction. Long life under constant use. Precision formed tip ensures proper fit. For driving and removing fasteners. Engineered for maximum durability and long life. Forged, so they fit more precisely, which reduces stripping. Heavy duty, cold-forged, high grade steel to withstand extremely high torque output. Black oxide finish resists corrosion. For power driving hex head screws, bolts and nuts. Design reduces rounding of the hex. Advanced hardening process provides max. durability. Extra strength magnets provide strong bit retention. Standard hex shank fits most power drill chucks. 1-7/16'' long. Engineered for extreme strength and durability. Made from proprietary steel and heat treated to control hardness. Ideal for high impact applications. Heavy duty construction for fastening capabilities in all impacts. 1/4'' hex shank. Milwaukee Shockwave Impact Duty Insert Socket Adapters are engineered for extreme durability and long life. Made from proprietary steel and heat treated to control hardness. Designed for use with Milwaukee Shockwave Magnetic bit tip holders. Heavy duty construction for fastening capabilities in all impacts. Made of shock resistant tool steel for maximum durability, resistance breakage and wear in metal, wood, deck and drywall applications. Hardened core for extra strength, reduced breakage and stripping. Universal 1/4" hex shank. Impact Ready accessories deliver exceptional performance for extreme torque applications. Flex Torq bits feature an extended Flex Torq zone to transfer optimal torque in hard joint applications, providing durability and longer life. The bit tip is CNC machined for a precise fit, reducing cam-out under torque. Magnetic screw lock sleeve minimizes drops and reduces wobbles. Impact ready bits can withstand up to 2000 in/lbs of torque. The perfect bit for high torque applications. Impact ready bit with magnetic screw lock system. Impact power bit. Square recess bit is built for maximum durability and long life with impact drivers. Forged bit for ideal fit, which reduces stripping. Cold forged, high grade steel to withstand high torque output. Black oxide finish resists corrosion. Impact power bit. Square recess bit is built for maximum durability and long life with impact drivers. Forged bit for ideal fit, which reduces stripping. Cold forged, high grade steel to withstand high torque output. Black oxide finish resists corrosion. Impact power bit. Square recess bit is built for maximum durability and long life with impact drivers. Forged bit for ideal fit, which reduces stripping. Cold forged, high grade steel to withstand high torque output. Black oxide finish resists corrosion. Impact ready. Torx point type. Point size: T27. Overall length: 2". Forged tips create a stronger and more flexible torsion zone, reducing breakage and extending bit life. Hardened cores increase bit strength and reduce fracturing. Ideal for fast, easy driving of nuts, bolts and hex head screws. Rugged single piece construction. Long life under constant use. Precision formed tip ensures proper fit. Lobular nutsetters are built for maximum durability, performance and long life with impact tools. Designed to drive the fastener from the side, rather than forcing the corners to turn, maintaining the true shape of the fastener and dramatically reducing breakage and damage from stripping. Also provides more clearance on the corners of the fastener where paint build-up often occurs. Black oxide finish resists corrosion to increase the life of the nutsetter. Made of shock resistant tool steel for maximum durability. Hardened core for extra strength and reduced breakage and stripping. Heat treated to resist breakage and wear; 1/4" hex shank. Impact ready bits with Flex Torq have increased durability for long life. CNC machined resulting in accurate manufacturing for optimal fit into screw recess. Reflex core allows bits to flex up to 15 degrees to reduce breakage. Part of 10X magnetic screw lock system for fastener retention which minimizes drops and reduces wobbling. Impact ready bits can withstand up to 2000 in/lbs of torque. The perfect bit for high torque applications. Impact ready bits with Flex Torq have increased durability for long life. CNC machined resulting in accurate manufacturing for optimal fit into screw recess. Reflex core allows bits to flex up to 15 degrees to reduce breakage. Part of 10X magnetic screw lock system for fastener retention which minimizes drops and reduces wobbling. Impact ready bits can withstand up to 2000 in/lbs of torque. The perfect bit for high torque applications. Impact ready bits with Flex Torq have increased durability for long life. CNC machined resulting in accurate manufacturing for optimal fit into screw recess. Reflex core allows bits to flex up to 15 degrees to reduce breakage. Part of 10X magnetic screw lock system for fastener retention which minimizes drops and reduces wobbling. Impact ready bits can withstand up to 2000 in/lbs of torque. The perfect bit for high torque applications. Sets drywall screws without breaking paper or damaging drywall core; 1/4" hex shank. Lobular nutsetters are built for maximum durability, performance and long life with impact tools. Designed to drive the fastener from the side, rather than forcing the corners to turn, maintaining the true shape of the fastener and dramatically reducing breakage and damage from stripping. Also provides more clearance on the corners of the fastener where paint build-up often occurs. Black oxide finish resists corrosion to increase the life of the nutsetter. Lobular nutsetters are built for maximum durability, performance and long life with impact tools. Designed to drive the fastener from the side, rather than forcing the corners to turn, maintaining the true shape of the fastener and dramatically reducing breakage and damage from stripping. Also provides more clearance on the corners of the fastener where paint build-up often occurs. Black oxide finish resists corrosion to increase the life of the nutsetter. Industrial deck bit tip that is shock resistant steel for maximum durability, hardened core for extra strength and reduced breakage, heat treated to resist breakage and wear and specially designed to reduce stripping; 1/4" hex shank. Forged tips create a stronger and more flexible torsion zone, reducing breakage and extending bit life. Hardened cores increase bit strength and reduce fracturing. Ideal for fast, easy driving of nuts, bolts and hex head screws. Rugged single piece construction. Long life under constant use. Precision formed tip ensures proper fit. Impact ready accessories are rated for 2000 in lb. of torque, 1/4" hex shank fits all quick change chucks as well as standard drill chucks. Used in applications by mechanical contractors, HVAC, deck builders, general contractors, and overhead garage door installers. Made of shock resistant tool steel for maximum durability. Hardened core for extra strength and reduced breakage and stripping. Heat treated to resist breakage and wear; 1/4" hex shank. Impact ready accessories are rated for 2000 in lb. of torque, 1/4" hex shank fits all quick change chucks as well as standard drill chucks. Used in applications by mechanical contractors, HVAC, deck builders, general contractors, and overhead garage door installers. Used in high torque power tools; for use in power drill chuck and chuck adapter; 1/4" hex shank. For use in impact drivers and wrenches; industrial strength magnet maximizes fastener retention. Impact ready socket adapters can withstand up to 2000 in. lb. of torque; for high torque applications. For use in impact drivers and wrenches; industrial strength magnet maximizes fastener retention. Impact ready socket adapters can withstand up to 2000 in. lb. of torque; for high torque applications. 3" Camo driver bit for use installing non-grooved deck board products. Impact ready accessories are rated for 2000 in lb. of torque, 1/4" hex shank fits all quick change chucks as well as standard drill chucks. Used in applications by mechanical contractors, HVAC, deck builders, general contractors, and overhead garage door installers. Geometric design provides the shock absorption zone. Proprietary steel and heat treat process for maximum strength and durability. Forged tip allows for a secure grip and maximum contact eliminating stripping or slipping. Geometric design provides the shock absorption zone. Proprietary steel and heat treat process for maximum strength and durability. Forged tips for maximum grip. Engineered for extreme durability. Made from proprietary steel and heat treated to control hardness. Geometric design provides shock absorption zone to extend life. The forged tip allows for a secure grip and maximum contact, eliminating stripping or slipping. Includes: (1) Phillips Shockwave power bit; 1/4'' diameter. Geometric design provides the shock absorption zone. Proprietary steel and heat treat process for maximum strength and durability. Forged tips for maximum grip. Geometric design provides the shock absorption. Proprietary steel and heat treat process for maximum strength and durability. Forged tip for secure grip and maximum contact eliminating stripping or slipping. Impact ready bits with Flex Torq have increased durability for long life. CNC machined resulting in accurate manufacturing for optimal fit into screw recess. Reflex core allows bits to flex up to 15 degrees to reduce breakage. Part of 10X magnetic screw lock system for fastener retention which minimizes drops and reduces wobbling. Impact ready bits can withstand up to 2000 in/lbs of torque. The perfect bit for high torque applications. Tamper resistant Torx screws feature a post in the center of the recess; this post will only fit into a tamper resistant Torx bit. Used in applications such as control panels, display cases, high-tech equipment, security; 1/4" hex shank. Lobular nutsetters are built for maximum durability, performance and long life with impact tools. Designed to drive the fastener from the side, rather than forcing the corners to turn, maintaining the true shape of the fastener and dramatically reducing breakage and damage from stripping. Also provides more clearance on the corners of the fastener where paint build-up often occurs. Black oxide finish resists corrosion to increase the life of the nutsetter. Used in applications such as installing or removing cup hooks, screw eye hooks or hanging decorations; 1/4" shank. For use in impact drivers and wrenches; industrial strength magnet maximizes fastener retention. Impact ready socket adapters can withstand up to 2000 in. lb. of torque; for high torque applications. Made of shock resistant tool steel for maximum durability. Advanced hardened core, heat treated for extra strength reduces stripping and breakage; 1/4" hex shank. Made of shock resistant tool steel; fits directly into the power drill chuck or Quick-Change chuck adapter; 1/4" hex shank. Includes (1) one each: #1, #2, and #3 bits. Engineered to be the more durable and better fitting. The optimized shock zone geometry is unique for each tip type to provide longer life and absorb 3 times more torque. Engineered for extreme strength and durability. Made from proprietary steel and heat treated to control hardness. Ideal for high impact applications. Heavy duty construction for fastening capabilities in all impacts. 1/4'' hex shank. Made of shock resistant tool steel for maximum durability. Hardened core for extra strength and reduced breakage and stripping. Heat treated to resist breakage and wear; 1/4" hex shank. Milwaukee Shockwave Impact Duty Insert Socket Adapters are engineered for extreme durability and long life. Made from proprietary steel and heat treated to control hardness. Designed for use with Milwaukee Shockwave Magnetic bit tip holders. Heavy duty construction for fastening capabilities in all impacts.